After seven years, I am back in the classroom. Well, sort of. At a recent mass, our priest made an appeal to the congregation asking for volunteers to teach religious education on Wednesday nights, also known as CCD. I would already be there, dropping of and picking up my son, so I volunteered to be a catechist. I had everything I needed: A teacher’s manual, textbooks and activity books for the kids, a roster, and a template for preparing lessons. The lesson plan framework was pretty specific. 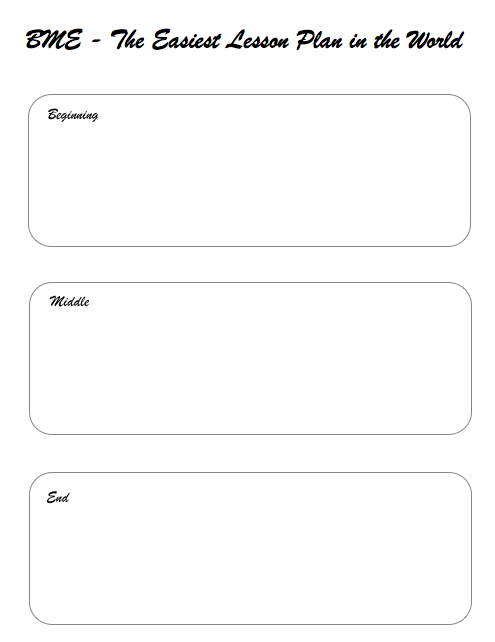 It was suggested that we detail the pages to be read, activities to design, what types of discussions to facilitate, and any assignments I might want to have my students do as homework. As a beginning teacher, these would be very helpful. I was appreciative of having all of the material ready for me ahead of time. But prior to becoming a principal, I was an intermediate teacher for seven years. As an observer and evaluator of instruction in classrooms for an equal amount of time, I have come to the belief that the lesson plan is more than a series of steps. There is a flow to a great lesson. It considers how to engage the learners. An excellent plan of instruction considers what should happen, but also considers what might. The plan always is steering toward that essential understanding or skill, but is able to change directions or provide multiple pathways to get there. That is why I use the simplest framework I could think of: BME, or “Beginning-Middle-End”. I have no idea if someone came up with this before me, so if I have replicated anyone’s work, my apologies. As I developed the meat of the lesson – the middle – I described the activities I wanted the students to participate in, but not too specifically. I wasn’t 100% sure how the beginning was going to play out, so I wrote a few instructional strategies to consider once we got started. It was during this time that I specifically pointed out what we were learning. In the end, my plan was to have the students motivated enough to find the answers to their questions that they couldn’t help but share with the class with the help of the text. 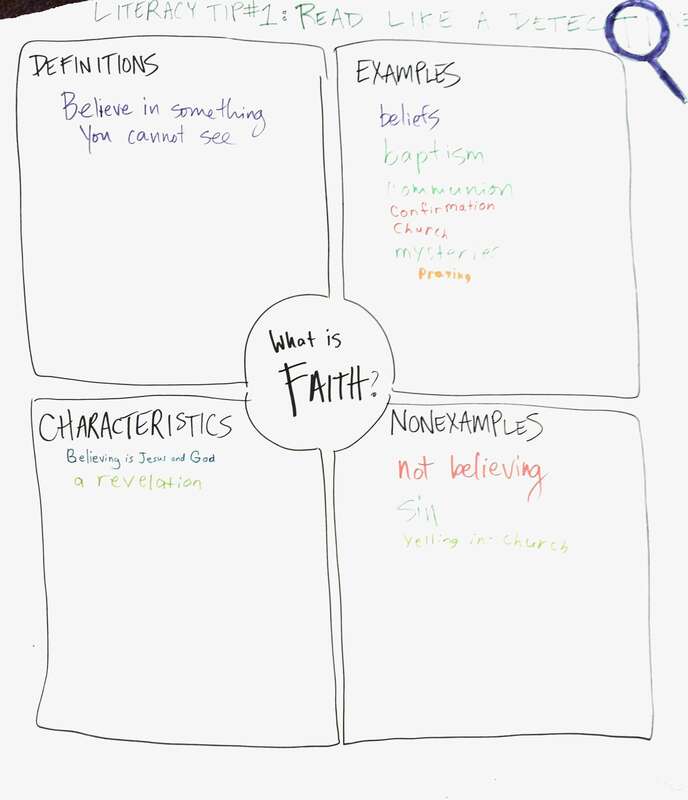 I modeled how to organize our information around the concept of faith using a Frayer model. I demonstrated this first, and then stood by and wrote their responses on the easel paper where the organizer was drawn out. Students who felt comfortable writing their responses independently were handed the marker. I closed out the lesson by commending everyone for such thoughtful responses and being active learners. We went through each response together to review our thinking before we left for the night. To be honest, we didn’t respond to every question in the activity book, nor did I take their workbooks home to check their answers. If I gave my students a test on the content from the textbook, they may not pass. I guess that is something to be aware of for next week. On the bright side, I felt like we had a better understanding of the concept of “faith”, and how it applies to our own lives. I also feel good about giving the students a few learning strategies while attempting to understand the content. I’d like to think it was integrated, authentic, and meaningful. I hope through my experience as a teacher again, however limited, that I will keep my instructional skills sharp, develop a better perspective about the role of the teacher in today’s educational climate, and try out some of the great strategies I see my own staff using every day. Once again, I am impressed with your honesty and insight. This is a very realistic and valuable model and I think teachers would be delighted with its simplicity. Your toe is always in the real world of a teacher’s life. Please keep your posts coming. Your contributions to this teacher in High Point, North Carolina are greatly appreciated. Thank you Vicki. I appreciate your feedback. Previous Previous post: Is an Adonit Jot Stylus for the iPad Worth the Money?